I’m re-posting a short write-up of a weekly practicum assignment from Alan Liu‘s Introduction to Digital Humanities graduate seminar in fall 2014 tonight so that I can cite it as an example from another blog post. There have been some (very small) modifications; the original write-up, from 3 November 2014, is currently available here for comparison, should anyone be interested in in making a comparison. Topic 0 is clearly a topic describing The Shadow Over Innsmouth , and this is notable even aside from the fact that the most prominent word visible in the cloud appears in that story’s title. Several other prominent words, for instance, are lower-cased proper names that appear repeatedly in that story: “eliot,” “dagon,” “zadok,” “walakea.” Also notable is the prevalence of heavy representations of New England spellings that are particularly prominent in that particular story, but don’t occur particularly often in most of the other stories in the group of texts being analyzed: “aout,” “ye,” “ud” (for “would”), “agin,” “sech,” “feller,” “jest” (not a joke in this case, but rural Massachusetts for “just”), “taown,” “seed” (an irregular past participle here). Topic 14 is also an Innsmouth topic, for the same reasons (“marsh” here is a last name, not geographical description). In fact, looking at the lovecraft_composition.csv file shows that these two topics together account for almost 30% of the story. Topic 19 is almost as prominent as 14, comprising just over another 7% of the story and having similar thematic concerns, though more diffusely so. But topic 19 is also a prominent component of two other stories and will be discussed in more detail later. 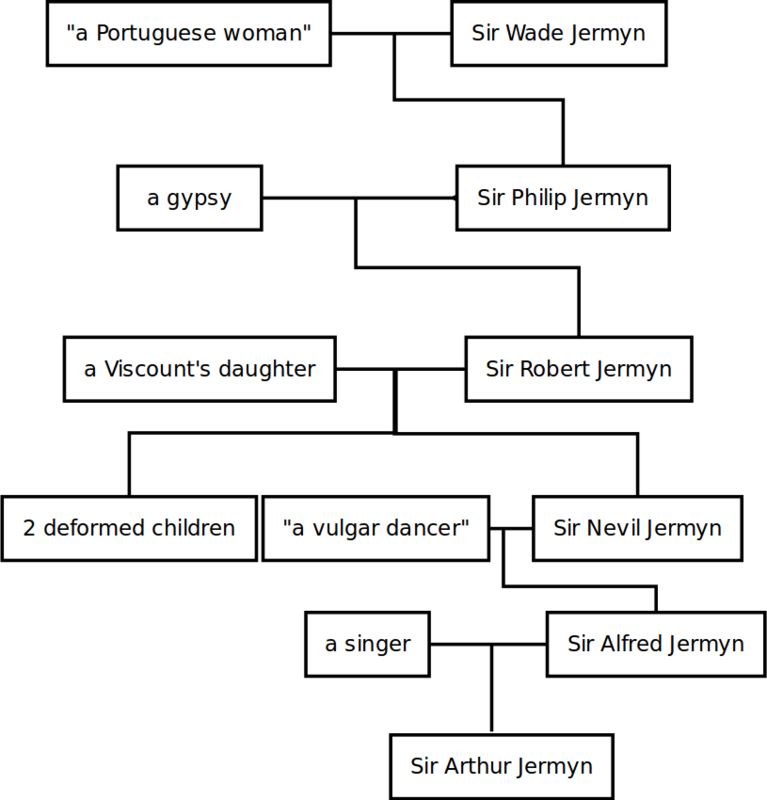 Topic 2 is clearly the “Arthur Jermyn” cluster, describing a story particularly concerned with ancestry and having a very troubling relationship to race. Notable here are the ancestral terms, since this story (note the titular end “… and his family”) is concerned with descent and biological race. Also notable are the names of Jermyns — here’s a family tree I threw together for a slide show when I was lecturing on it: In this case, examining the lovecraft_composition.csv file shows that this cluster alone accounts for 39.8% of the topics in the story— the next largest topic is topic 24, which accounts for only about 8.38% of the story (and note the prominent presence of the word “black” in that cluster, as well as prominent genealogical words (“child,” “children”) and words the story uses to describe physiognomy (“face,” “head,” “parts,” “arms,” “appeared,” “ghoulish,” “slope”). To avoid belaboring the point, I’ll just point out quickly that, even without going through the data, and just from looking at the word clouds, it’s apparent that topic 6 is a cluster centering around “The Dunwich Horror” (names of the Whateleys, and the family name as the most prominent word in the cluster; again, the emergence of dialect renderings); topic 8 is the “Erich Zann” cluster (the name, and musical terminology); topic 9 is the “Herbert West” cluster (again, the name; also, words associated with the Frankenstein theme of the story: technical terminology from anatomy and the concern with the educational setting); topic 13 is the “Call of Cthulhu” story (multiple names are indicators here this time, since “Cthulhu” occurs a fair amount in HP Lovecraft stories; the settings; the thematic and symbolic elements: “museum,” “hieroglyphics,” “idol”); topic 18 is the “Cats of Ulthar” cluster (“cat” and “cats” are prominent, a dead giveaway here: cats are not a large thematic concern of Lovecraft’s; the setting: “remote” “cottage”; the main characters: “wife” and “wanderers”). I admit that until I looked at the data, it was not immediately apparent to me that topic 17 was a cluster centering around “The Lurking Fear,” but on second glance it clearly is: “thunder,” “lightning,” and “tempest” are major thematic concerns and plot-event motivators there, and the words “lurking” and “fear” occur prominently; there’s also a group of underground-related words (“digging,” “mounds,” “underground,” “tunnel”), and underground is where the terrifying creatures live in that story. Similarly, I missed the fact that topic 21 is clearly the “Polaris” cluster, despite the clearly astronomical cast of the topic: “horizon,” “overhead,” “quarter,” “north,” “plateau,” “peaks,” “pole.” (But in my defense, I haven’t read “Polaris” in a long time, possibly since high school, and I only picked it out to have a tenth text.) Looking at the data clarifies a number of things. There aren’t many thematic elements contributing prominently to the individual stories. For half of the stories on this list, the top two topics alone account for 48% or more of the stories in question; for three stories, the top two topics account for more than half of the stories’ content. 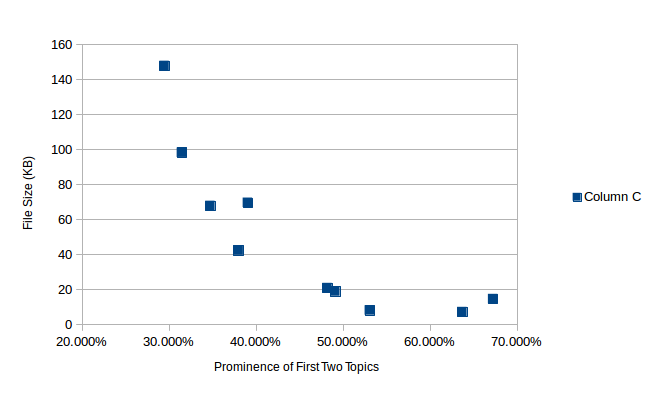 In all but one story ( Innsmouth ), the top two topics account for at least 30% of the story’s content, and Innsmouth comes close at 29.43%; Innsmouth is also the longest story, at nearly 150K of plain text, and one might reasonably expect a longer story to contain a larger number of prominent topics than does a shorter one (i.e., the longer it is, the more it has to contain to keep reader interest and to produce a horrifying effect). In two stories (“The Cats of Ulthar” and “The Doom That Came to Sarnath”), the top two topics account for over 60% of the story’s content (63.71% and 67.25%, respectively). These are both short stories (7.2K and 14.6K of plain text, respectively; the first and third shortest stories in the group under analysis). Topic 19 might be designated the “patriarchy” cluster: “great,” “men,” “city,” “spoke,” “heaven,” “pillars,” “art” and “artists,” “worship,” “manuscript,” “day” and “time” and “year,” “notes,” “letters,” and “words” all fit this pattern. There is also a concern with patrilineal descent: “elder,” “young,” “aged,” “born,” “mortal,” “died,” “native” — and with the way that knowledge was transmitted: “spoke,” “showed,” “found,” “ears,” “clear.” But this is not an unqualified endorsement, but rather an uneasy (“vaguely”; “half”; the qualifier “whilst”) anxiety about its displacement (“unknown”; “silence”; “strange”; “aspect”; “bizarre”). Topic 24 might be said to be the most obviously “Lovecraftian” cluster, indicating the particular plot-mechanical devices that Lovecraft helped to solidify into the canon of hoary horror tropes: “nearer,” “door,” “room,” “sound” and “sounds,” “fire,” “missing,” “dark” and “black,” “lights,” “call,” “heard,” and that which provokes terror because it is very “large” (a particularly prominent thematic concern for Lovecraft — the back side of the Romantic sublime, in fact). And there are the keywords indicating the traditional horror setting and its problems: “amidst,” “room,” “slope,” “nearer.” The parts of the body mentioned are those that are both vulnerable and closely connected to identity and interpersonal connection, especially in the context of romantic and sexual love: “lips,” “face,” “head,” “hand,” “arms”; these provide a reading of a related word, the fragile human connection indicated by “touch” (which is precisely what is punished in much later high school slasher-horror movies). Also prominent are words associated with the emotions supposed to be provoked by the horror genre: “terror,” “wild,” “dare”; the typical “manner” in which horror achieves its effects and by which it advances its plots: “suddenly,” “finally,” “strange,” “stay” and “sat” (almost always mistakes), “met” (such a necessary plot device for the genre), “utter” (I suspect this is most often a verb in these texts), “sleep,” “guided,” “ascent” (Lovecraft is here the antecedent of the writer who sends the ditzy heroine up the stairs while she is being chased, though Lovecraft’s protagonists are more likely to be male and seeking rather than fleeing). Too, there are the traditional larger-scale thematic concerns for the genre, the “what’s really at stake” keywords: “exist”; “truth”; “memory” and “reason” (precisely what is threatened by Lovecraft’s supernatural forces); “man” (in the double sense of the masculine taken as the default human); “perfect”; “alive” (a state that is often itself a source of horror in Lovecraft’s fiction). Topic 3 is another knot of traditional horror settings, plot devices, and concerns. Topic 11 is much like topic 10, but critiques these concerns through juxtaposition with rural, uneducated people who have a rough and terrible wisdom passed down from generation to generation. Topic 22 might be taken to once again express a tension between the epistemological claims of traditional religion and modernizing scientific thought. Topic 23 might plausibly be read to express anxiety produced in response to the crossing of (generally never questioned), which I tend to see as a major characteristic of horror. More specifically, in this case, the boundaries in question are biological and generational boundaries. It appears prominently (i.e., top 5 topics) in only 3 of the stories under consideration: “Herbert West, Reanimator” (the eponymous character is a college Frankenstein); and “Arthur Jermyn” and “The Lurking Fear,” both of which are concerned with human-ape hybridism. And that, there, is a set of preliminary observations about what I found topic modeling these texts.